Today i am going to share America's top dog food and its called hot dog. It is one of the most loved food in America and has spread all over the world like a virus. My special thanks to Arabs who introduced halal hot dogs and now we can buy from our local grocery shop. As they say the world is Americanized and there is no doubt about it, most of the leading brands are American and the food world has American control over it and there is nothing wrong with it. I think America needs more respect then we actually give, it is Americans who have given some of the best food and styles to the world, why do we only look at America's negative aspect's, why don't we look at what America has done for the world. I am not an politician, i am a cook and i love good food from any culture or nation. I love digging the history for the best recipes and i can feel how people used to live and how they used to enjoy through their food. 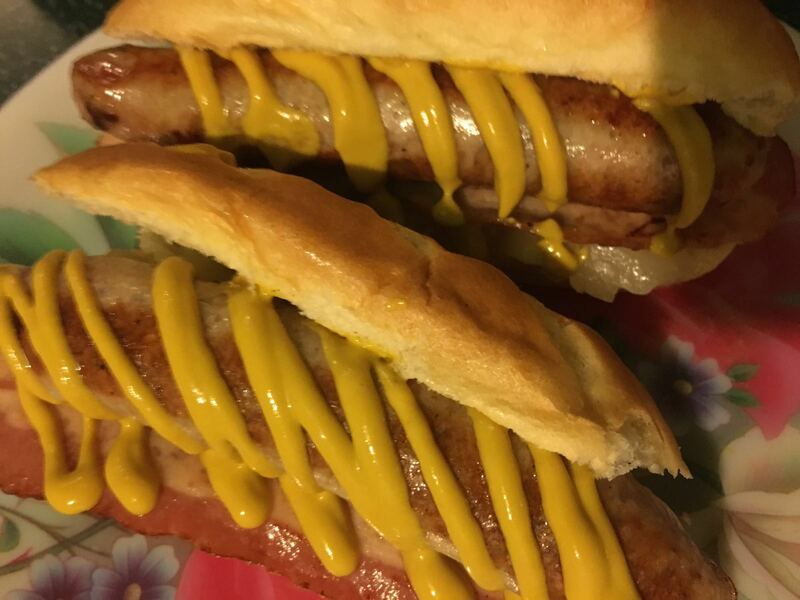 The history of hot dog sausage is beautiful and very long, as it is world's oldest processed meat. The history book written by Greek historian in Homer's Odyssey "As when a man besides a great fire has filled a sausage with fat and blood and turns it this way and that and is very eager to get it quickly roasted. . ." 9th century BC. So you can imagine how old this meat is. When you have such an famous food there are bound to be differences about who owns the original recipe. 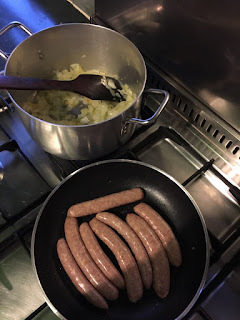 The Romans claim this as their own as it says in Emperor Nero Claudius Caesar's (54-68) cook, Gaius, is often credited with discovering the first sausage. In 1987, the city of Frankfurt celebrated the 500th birthday of the hot dog in that city. 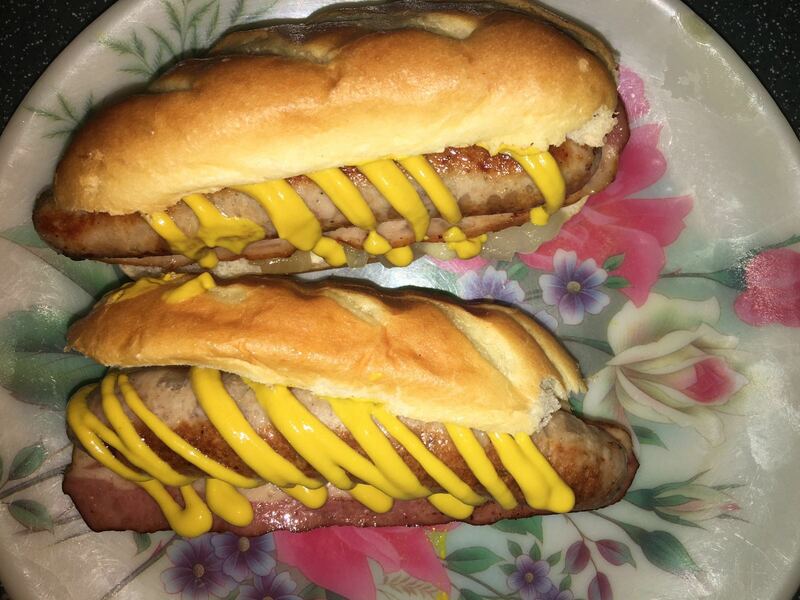 It's said that the frankfurter was developed there in 1487. 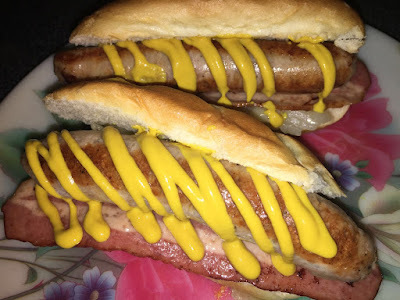 1852 - The butcher's guild in Frankfurt, Germany introduced a spiced and smoked sausage which was packed in a thin casing and they called it a "frankfurter" after their hometown. If you like it please do use comment box below and do not forget to subscribe our site to get new recipes everyday, we don't just share the recipes from around the world, we dig the history for you to bring some of the best recipes for you and we bring the memories of ancient life into your kitchen. Heat 2tsp oil in a nonstick pan, add onions and cook till transparent. Heat 1tsp oil in nonstick skillet, add sausages and cook for 5 minutes each side or till brown from all sides, add turkey rashers in the skillet and cook till rashers are nice and crispy. Slice the buns from the middle going long way, add onions in the bun, place turkey rasher on top of onions, place cooked sausage on top and add mustard paste.